Ty Mawr named on Good Shopping Guide! 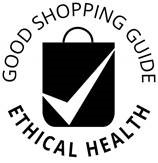 We are delighted to be listed in the Good Shopping Guide – the UK’s Ethical Comparison website – that has researched the activity and impact of these companies over 2017 and categorised them! Most of us are now aware of our own environmental footprint, but we should also know that there is also an ethical footprint every time we shop - so it is good to see this list, recognising those in the retail industry who make the effort to be responsible as well as environmentally-friendly not only in their own day to day activities and choice of raw materials/ingredients/components but also in their supply chains and in their own communities. To see who else made the good (and bad!) shopping guide please click here! To learn more about Ty Mawr’s environmental policies please click here.